Based on the Maroon 5, feat. Christina Aguilera, song "Moves Like Jagger." 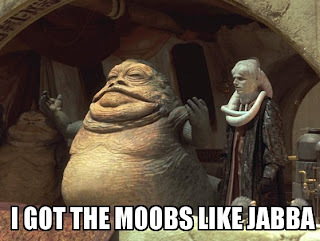 He definitely has the moobs! that is funny, i didn't even know what we were talking about... it's kinda of a thing like senfield's "the bro" or something like that. Alex, I never noticed it until I saw the picture. His tongue distracted me. Poor Jabba. He was probably picked on in school by bullies. Michael, at least they couldn't say he looked like Jabba. 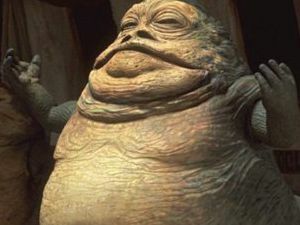 He was Jabba. Comments? Uh . . . just another thing to associate with Jabba the Hutt, I guess. LOL.